One of the Most Popular International Gaming Technologies (IGT) Slot Machines is called Cleopatra. An online version of this popular land-based casino slots game is currently being offered at All Star Slots, which is one of the most respected Real Time Gaming (RTG) casinos on the internet today. The look and feel of the online version of Cleopatra is quite similar to what you would find in a casino. The game has five reels, free spins and an exciting Bonus Round. To play Cleopatra Slots online, click here. The Mission of Play Video Poker Slots is to locate online versions of the most popular casino slots and make them available to our visitors in Free, No Download format. Oftentimes, the online versions of these slot machines have a slightly different name, or appearance, to the land-based versions, which can make it harder to locate these games online. In the case of Cleopatra Slots, the online version has the word 'Gold' added to the name. The reel symbols are slightly different, but this game is basically the same as what you would find in your local casino. At this time, it is necessary to download the All Star Slots Software in order to play all the online slots games. This slot machine is your typical five reel video slot, with multiple paylines (20) where the player can wager up to $5.00 per line for some real high-stakes gaming action. Cleopatra is the Wild Symbol and can substitute for all symbols except for the Scatters. The game features an Egyptian theme and score and reel symbols are directly reflective of ancient Egypt. Ra, Isis, the Egyptian Cross and Cleopatra are all evident in this richly animated game. Players who enjoy playing Cleopatra Slots in their favorite casino can now enjoy the online version of this popular machine. Cleopatra Queen of the Nile is who you want to encounter to unlock the Jackpot, but beware as you will also encounter dangerous Asps, Ancient Pyramids and the all-seeing Eye of Horus. This game has an excellent Free Spins feature where additional free spins can be awarded and the Bonus Round can be entered during Free Spins mode, as well as during regular play. Cleopatra is another of the latest slots games we have found to have an online version, although the name of the online version of this popular slot machine is not Cleopatra but Cleopatra's Gold. The online version of this slot has a slightly different variation of its name, probably because the online software developers, RealTime Gaming (RTG) have not licensed the name from IGT, but we can't help just calling the online game Cleopatra due to its overall similarities to the casino version. Cleopatra's Gold online slots feature five video reels with a combination of symbols, each reflective of Ancient Egypt. The reel symbols include the Sun God, Ra, the Eye of Horus, Pyramids, Isis, Asps and Cleopatra herself. The casino version of this game is known for an above average hit frequency and the online game appears to be no different. The top jackpot of this slot machine is 30,000 coins and may be randomly awarded at the end of each spin. Players like this game because it is exciting, has excellent graphics and an impressive accompanying score. The design and smoothness of the reels is first rate and multiple smaller payouts can make the player's bankroll last a long time. This is also the type of machine where you can reasonably expect to win the top jackpot, given sufficient play. Where Can I Play Cleopatra's Gold Slots Online? Currently, one of the few online casinos that is offering Cleopatra is: All Star Slots. 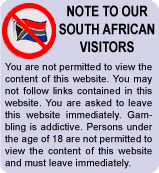 The game is offered in Demo (Free) Mode, and as an actual real money slot game, either from the No Download Flash Version of the casino or from the actual casino download. This game is your basic five reel, video slot machine with multiple paylines. To wager real money, it will be first necessary to make a deposit at the casino and then to select this game from all available slot games. Players should make sure they always play the maximum number of coins per payline (5 coins) so that they are eligible for the top jackpot. 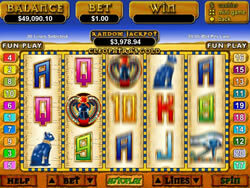 The animation and audio accompaniment of this online slots game are very realistic and visually stunning. So, whether you choose to call the online version of this slot machine Cleopatra's Gold or, simply, Cleopatra, we believe you will be pleasantly surprised by the excitement and fun you will have when playing another of your favorite land-based casino slot machines from the comfort of your own home. Once again, we at Play Video Poker Slots hope to be the first to bring you new and exciting slots and video poker games online.